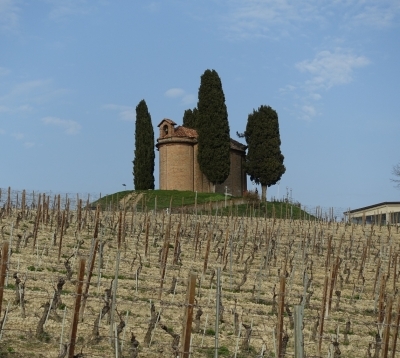 The Vineyard Landscape of Piedmont: Langhe-Roero and Monferratois is a harmonious landscape of cultivated hillsides, hilltop villages and other built elements. It is one of the most ancient wine-producing regions in the world. The earliest traces date back to the 5th century BCE. It developed further during the Roman period. Since the 19th century it has become one of the main centers of the international wine trade, producing well-known wines such as Barolo, Barbaresco, Barbera, Asti Spumante and Canelli Spumante. I’m down to 3 in my quest to ‘complete’ Italy: Mt. Etna on Sicily and Su Nuraxi di Barumini on Sardinia are still beckoning. Interesting sites, but a bit too far away for a weekend trip. So (with a little reluctance) I settled for the 3rd remaining WHS: the Vineyard Landscape of Piedmont. This is a serial nomination of 6 sites in Northern Italy, situated east and south of Turin. 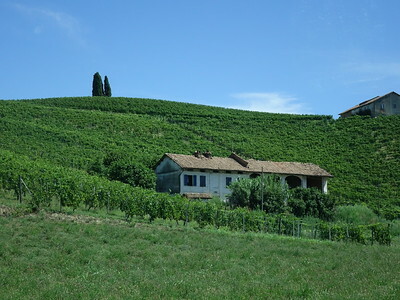 Within this group, I focused on the wine growing area of Nizza Monferrato. Nizza Monferrato is the namesake of Nice in the Provence (called Nizza or Nizza Marittima in Italian): both once belonged to Duchy of Savoy and got their suffixes to distinguish between the two. I travelled to the Italian Nizza by a combination of train and bus from Turin. The trip takes about 1.5 hours, and a transfer is needed in Asti. From that point on the flat surroundings of the northern industrial cities are replaced by a landscape of cultivated hills. That’s where the WH area begins. The bus travels via one or two interesting hillside villages such as Mongiardina. I expected Nizza Monferrato to be something similar, but this is a fairly large town of over 10,000 inhabitants. In the nomination dossier it is highlighted as the best example of a vilanova: a medieval settlement with a main, arch-lined street and a market square for the sale of local products. So there I was, in the city center. But what’s to see? I had noted down a few sights that are named in the nomination dossier: there should be a market, 19th century ‘devanture displays’ like a bottle resting on a wine glass, a Museum of Taste and an Etnographical Museum. On my first round of the center however I only encountered locals enjoying their first coffee of the day and chatting with their neighbours. Signs to city attractions are seriously lacking, and I only had a basic map. I eventually found my way to the Palazzo Crova. This 18th century villa nowadays houses a wine bar & shop, plus the Museum of Taste. Noone was around though and the doors to the Museum were closed. I was similarly unlucky with the Museo Bersano, the etnographical museum. This lies just across the street from the train station. They have an outdoor exhibition of tools used in the wine industry. It sounded as the most interesting thing to see in Nizza Monferrato, but I encountered another closed door. The museum is only open between 9 and 11 on weekdays! This must be a recent change, as the hours advertised on the internet are much longer and include weekends. I had to console myself with looking at some of the exhibits through the closed iron gates. Rather desperate now I tried to find another mysterious sight described in the nomination dossier: “a multi-storey residential building, from the early twentieth century, richly decorated with graffiti representing bunches of grapes placed in vertical ornamental stringcourse”. Could this be the one? By ‘graffiti’ they probably meant ‘sgraffito’ and not the spray paint type. My expectations of this WHS weren’t already high beforehand, but this visit was totally underwhelming. And although vineyard landscape aren’t among my favourite kind of WHS, I have spent some pleasant days in Lavaux, St. Emillion and Champagne. This part of the Piedmont though is very built-up and winemaking is big business. Having arrived in Nizza Monferrato by bus from Alessandria I made my way into the old town to the central square. I had expected yet another of the pretty old towns that you find all over Italy, this one with a bit of wine focus. Instead I found a fairly mundane modern town with some old buildings in between and I was left wondering: Why is this on the list? Ahead of my visit I had studied the reviews on this site and wasn't expecting much. If even Els can't find many - let alone nice - things to say you know this probably isn't one of the greats. But still, I had expected something and the "old" town of Nizza Monferrato just had very little of anything to show. If this is WHS material, every second town in Italy would deserve the honors. To get a bit deeper into the vineyards, I decided to hike North West into the hills. As soon as I climbed the hills I got some nice views of the vineyards. The Bricco de Monferrato (picture) itself is a nice photo opportunity. As a practical recommendation, it's worthwhile to take a proper look at the 60MB large site map before visiting. It kind of messes up your data plan when you do that in the hills of Nizza Monferrato looking frantically for OUV and those fabled vineyards. Frankly, I am hard pressed to make out anything resembling OUV. In a site like St Emilion you have a rock hewn church and a nice old town as a highlight. Also Burgundy has Dijon and Beaune to show. For this site it's really down to the vineyards that look more or less like vineyards look everywhere. The German vineyards along the Moselle and the Rhine are more impressive than what I got to see in Piedmont. As a consequence I awarded the lowest rating (0.5). If you are visiting by public transport your options are limited. The area is fairly rural and access by public transport not very frequent. The next largest towns are Alessandria and Asti. My recommendation would be to hike between Nizza Monferrato and Castelnuovo Calcea. Castalnuovo Calcea is on the west end of the Nizza Monferrato vineyards location and is served by a few busses a day running between Asti and Nizza Monferrato. Nizza Monferrato meanwhile is on the South Eastern tip of the core zone, so you can traverse the full core zone in a 2h walk taking in the scenery. In Nizza Monferrato you can connect by more frequent busses with Alessandria from where you can connect easily by regular train to Turin and Milan. In my case I started and returned to Alessandria in an afternoon. 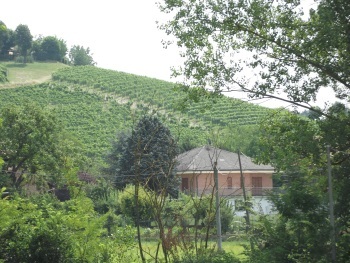 I stayed a few hours in Nizza Monferrato from where I ventured into the vineyards to the North West. Follow the Strada Bricco de Monferrato up into the hills and you will have nice views of the Piedmont vineyards plus the fairly picturesque Bricco chapel. While Google maps has the proper schedules, it does not have the correct bus stop for Alessandria. If you are exiting the train station go the road, do not cross the road, turn right and follow the main road, till the parking lot in front of the train station ends. There you should find the post office The (blue) bus should start from there, but better ask the bus drivers of the blue (regional) busses. The bus stop in Nizza Monferrato is infront of the train station bar. In each case tickets are sold on the bus. My favourite place in Italy besides Rome is not Venice, Florence or Tuscany but the relatively obscure wine producing region of Barolo in Piedmont. This seems to run counter to most of the comments here, but Piedmont is the only region that has successfully grown and produced wine from Nebbiolo. The scenery is also beautiful and the wine some of the most complex in the world, but most importantly here you can meet some of the most hospitable people who work in the wine trade. I spent some time touring Asti, Alba and Nizza Manfrotto in Piedmont in search of the OUV of this site, but it eluded me. I had previously visited the vinyards of St Emilion and Lavaux, both of which seemed outstanding. So I hope that the new WHSs of Champagne and Burgundy offer more in terms of OUV. Producing good wine does not to my mind create OUV. We have superior wines produced in New Zealand, but I doubt that the vinyards here would claim any OUV. Today vineyard and more vineyards tomorrow, the groaning words from my cousin that I heard almost every day when we had to join our parents wine trip in France, Switzerland and Northern Italy, from Champagne to Barolo, the ultimate trip for wine lovers! I have to admit that in that time I was not happy, but at the end at least two vineyards from that trip have become World Heritage Sites and many still waiting to be listed, and that make me quite happy at least I don’t have to revisit those vineyards again. As I mentioned Barolo was one of our destinations, after long trip in French vineyards, I entered Italy with high expectation for some change to cure my overdose on French wine. The hilly vineyard landscape of Piedmont is really beautiful and so contrast with much lower hill of Burgundy and Champagne. The villages are really pretty and there even has castles on the top of the hill, a beautiful place indeed. Apart from geography and architectures, I could not see much difference from other famous vineyard in France. And I have to admit that I did not have time to appreciate the place, most of the time was spent on wine testing and wine shopping. Apart from the vineyard, we went to Barolo castle, to see old wine and olive oil pressing machine and other many small villages including the famous and beautiful La Morra and Barbaresco. Strangely I don’t know why we skipped Asti, another famous area for Italian sparkling wine and Monferrato for Ruche. Anyway the Barolo and Barbaresco wines are unquestionably good and pair perfectly with northern Italian cuisine. We continued our wine trip to Lavaux, another wine region in Switzerland and World Heritage Site via beautiful alpine vineyard of Morgex in Valle d’Aosta. One of the things I tried to tell myself during that trip was that each vineyard is different; there is no similarity in the landscape, the soil, the grapes, the winemaking process, the products, and the wine price. The differences that need time and love to understand the uniqueness of each vineyard, but for me, after Champagne, Burgundy, Arbois and Rhone, vineyards finally become just another vineyard, and amazing that eight years after, I still suffer from that trip and don’t want to visit anymore vineyard. Built in the 5th century BC: Vine pollen has been found in the area dating from the 5th century BC (Nom File).